4most Display – Features complete onboard HDMI, DVI, D-Sub and Display port for more flexible, complete and convenient multi-media plug-in options for excellent visual performance. All Solid Capacitors – ECS’s All-Solid-Capacitors design brings the great benefit of better durability to users. Better conductivity and heat resistance can be expected as well thus the system stability can be assured under critical conditions. Rapid 333 – Support latest generation USB 3.0, SATA 3.0 (6Gbps) and eSATA 3.0 (6Gbps) high-speed interface technologies that meet the high-capacity and high-speed needs of multi-media publishing and PC gaming. Clear CMOS Button – One of ECS 4″E” Design which is especially a great plus that brings users remarkable convenience while overclocking or tweaking system performance. Dual Channel DDR3 2600 OC – Dual DDR3 2600 O.C. is able to raise processor and RAM clock up to 2600mHz through capable RAM in overclock mode. It assists system to obtain optimal performance to meet the O.C. enthusiast needs. EZ Charger – provides 3 times current than general USB port in off mode for USB devices. It’s useful and excellent, especially for the iPhone, iPad and iPod touch devices that need a large amount of current for faster recharging within less time. º When install VGA cards in all PCIe x16 slots, it runs at x8+x8; When only one VGA Card,recommend place it in PCIE x16 slot near CPU socket. 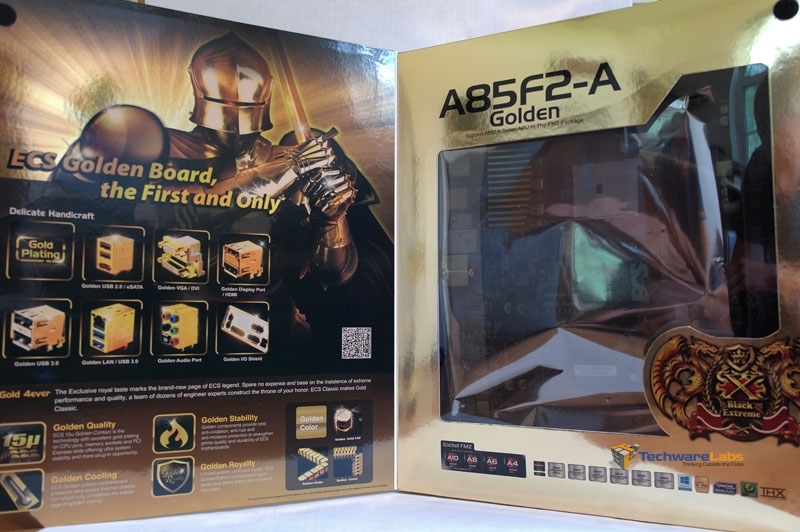 If you take just one glance at this motherboard’s box you can tell that the focus here is gold. Virtually every printable surface is either covered in highly reflective gold or talking about gold. 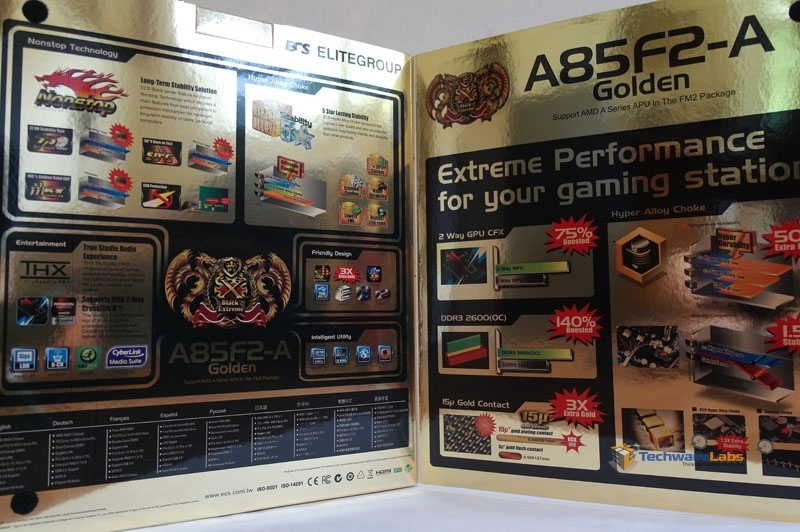 The front and back have flaps that open up and give details about the board with the front talking about the gold parts and the back listing the different features of the board. 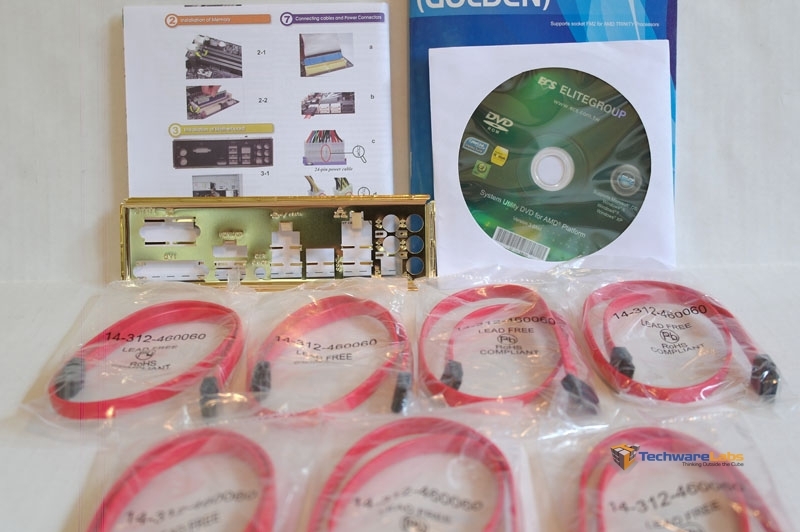 Aside from the board itself ECS includes a user manual, install guide, driver cd, I/O plate, and a whopping seven SATA cables. Yay, knock-off gold colored substandard Taiwanese solid capacitors. The gold color makes them perform better.